Below is a list of things you can do in the morning to create a personalized routine that works for you. You certainly don’t have to do all of them! Pick one or two to get started, and build from there. And while consistency is important, if something isn’t working for you, change it up and try something new. This routine should be fulfilling and meaningful to you. Affirmations – I suggest using “I am” statements. As you are getting ready in front of the mirror, look yourself in the eye and speak aloud three “I am” affirmations. Gratitude – place a note somewhere you’re going to see it in the morning that asks you: ‘What am I grateful for today?’ List three things aloud. Smile – the moment you wake up, smile. Even if you don’t feel like you have a reason to, or you feel grumpy. Smile anyway, just for a few seconds. Believe it or not, this can help to shift your brain into a more optimistic mindset. Breathe – take a few moments to practice some breathing exercises for centering and grounding. Coming at the day from a grounded mindset can make a huge difference in how we react to our experiences. Meditate – even if you do this for only a few minutes. Bring your awareness to your heart, and ask to bring that heart-centric energy into every moment of your day. Be present – often when we wake, we just hit the ground running. Bring yourself back to the moment. Spend a minute with yourself to regroup. Cuddle a pet – pets are pure love, they are fantastic to help shift you into a higher vibration. A few morning cuddles can be incredibly beneficial to us, and them. Stretch – this may be a bit ambitious for those who don’t enjoy mornings. Still, a few gentle stretches are good for our body and mind. Set your intention – what kind of day are you going to have? It’s your choice! Speak up, say it out loud. Today is going to be… Productive? Fun? Peaceful? Set your intention and bring it with you for the day. Journal – This one can be incredibly impactful, if you can find the time to work it into your morning. I often encourage people to keep a notepad by their bed to write down any dreams that stay with them after they wake. But writing in the morning can serve another purpose. When we are sleeping our subconscious takes over. We are working through our experiences from a different level of perception. When we wake, free-writing – that is, writing whatever comes to you without judgment, just flowing with it – can bring forward surprising and powerful insights. 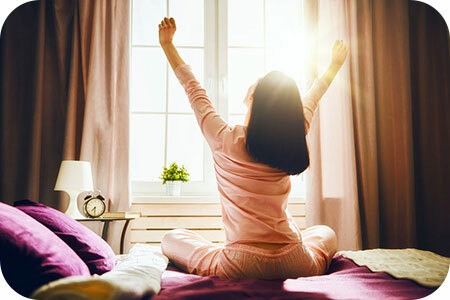 While you may have to get up a few minutes earlier than usual to incorporate some of these activities in your morning, doing so can have a powerful impact on your day. As you make a habit of this practice, you’ll find yourself looking forward your time in the mornings. Even if it is only a few moments here and there. As we get lost in our daily lives, prioritizing our own energetic imprint is something that we can forget to do. But as we are co-creating our reality, we must ask ourselves: “Am I projecting my intent for creation?” or “Am I responding to what is already created?.” And which would you rather be doing? I think of setting up my energy for the day the same way I think about brushing my teeth. It’s like part of my personal hygiene. What is my intent for the day? What do I wish to make of the day? It is my hope that the steps offered here help to remind you of your incredible power to create.